This Irish scarf features shamrocks on both sides and fringe at both ends. You will stay warm as this shamrock scarf features a 100% acrylic material and it measures 8" wide x 70" long. 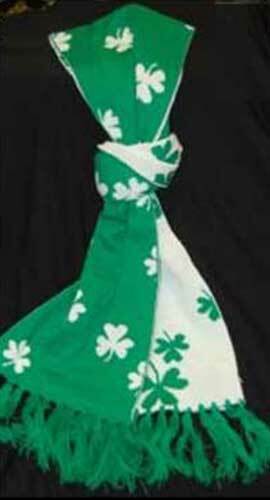 The Irish scarf is reversible with white shamrocks on one side and green shamrocks on the other side. The Irish scarf is received with a shamrock history card, complements of The Irish Gift House.